Store, protect, and transport your valuable photo, electronic, or other gear with the waterproof and dustproof, silver 945 Case with Foam from NANUK. The case features a removable cubed foam insert, and a foam piece for the inner lid. PowerClaw latches and holes for optional user-supplied padlocks provide secure closure. Users will appreciate the strong NK-7 resin construction, automatic pressure release valve, integrated lid stay, and large, folding, soft-grip handle. The 945 case is stackable with same-size cases. 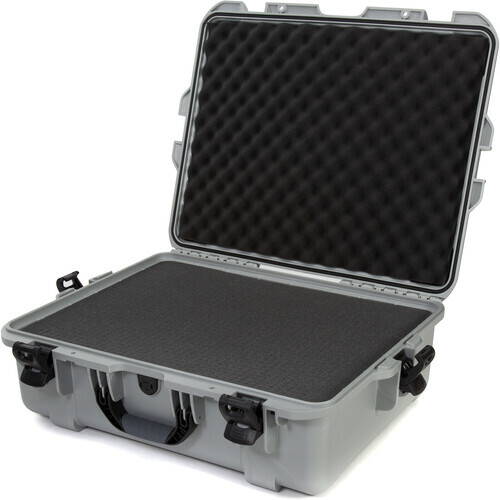 945 Case with Foam (Silver) is rated 4.8 out of 5 by 5. Rated 5 out of 5 by Daniel from perfect case to store lenses and other items Well built just like other hard cases but, Nanuk have better closures that lock and will not accidently open. The locking feature is what brought me to Nanuk. Also, cheaper than Pelican size for size. I plan on storing my camera lenses while not using, and the case has a decent size rubber O gasket to seal-out air. Because of the case size, it has four locks instead of two - well thought-out. Not heavy with all the lenses that I have placed inside from 200-500mm to 50mm. Mine has foam but, other options are available. Will place desiccant inside while storing to remove any moisture and keep contents safe. Rated 5 out of 5 by Dan from Lightweight, strong, fantastic latches Sometimes these plastic cases can be really heavy and, especially in the old days, almost guaranteed a broken fingernail trying to open them. The Nanuk 945 has easy opening latches that also stay very securely closed until you want them open. The case is light too. I saw them at NAB2012 and was impressed. If you get the pick-n-pluck foam option, you get foam in the lid and two layers of 1-1/2 pick-n-pluck in the base. I like that the Nanuks come in a variety of colors. Makes it easier to find in a sea of black cases. Rated 4 out of 5 by Chris from Good but no Pelican. It does its job. Latches seem a little wonky and floating in a truck full of Pelicans, it seems to wear a bit easier. Pluck foam is essentially what comes in Pelicans. All in all it keep my LitePanel Astra safe and that's all that matters. Rated 5 out of 5 by Grangecam from Great case with well designed latches I bought this case to pack my Anton Bauer charger and dionic batteries in. Originally I was going to get a custom foam insert made, but the price of the included foam is so low that I decided to give it a try. It's better foam than I've had in previous pluck-foam cases and I think it's going to hold up well. The latches are great. No stress on the fingerbones to get them open or closed. What is the weight of this case with foam? This case weighs 10.6 lb. Will this case hold an Astra and a couple batteries with a small charger? Or does an Astra pretty much fill it up? You will be able to fit the Astra 1x1 and batteries with a charger in the Nanuk 945. Will the DJI Phantom 4 fit the NANUK 945 made for a DJI Phantom 3? A case with custom fittings for a DJI Phantom 3 will not be compatible with other models. I know that this will accommodate a Phantom Vision Plus drone, what I need to know if you can use it with prop guards attached?